In today’s distributed enterprise, efficient utilization of bandwidth, increased security, and ease of deployment and management are important factors when considering a WAN acceleration solution. Throughput can be exhausted by collaboration applications such as Microsoft SharePoint and Windows File Sharing. At the same time, due to the popularity of Web 2.0 and social media, an exponential increase in Internet traffic is already overburdening WAN bandwidth. This inefficient utilization of available bandwidth results in higher latency, lowering employee productivity. Spending more on increased bandwidth or enhanced services, or purchasing disparate point solutions, does not resolve the problem. 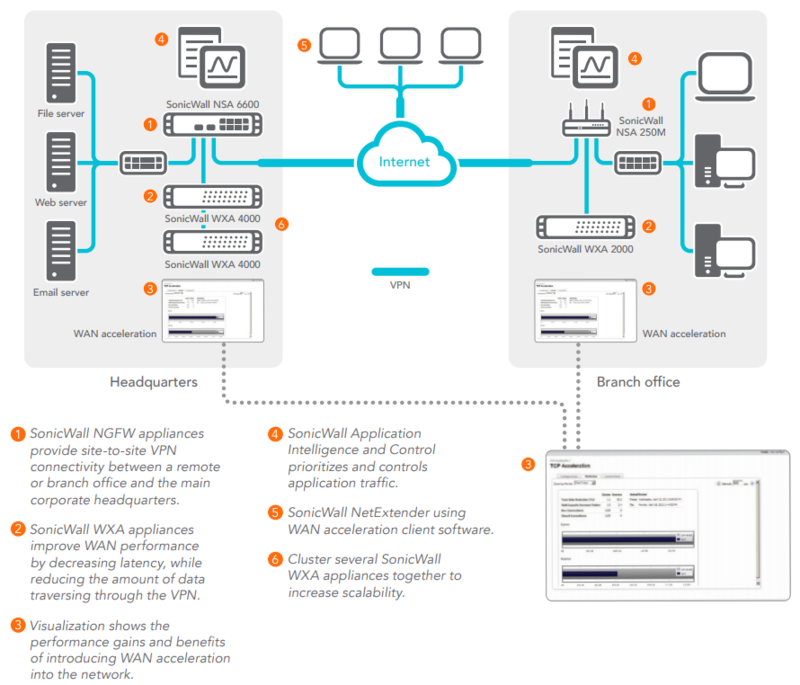 The SonicWALL WAN Acceleration Appliance (WXA) Series enables you to easily and securely enhance WAN application performance at remote and branch offices, thus improving the end user experience that leads to increased productivity. Unlike standalone WAN acceleration products that are deployed either behind the firewall or between the firewall and WAN router, the SonicWALL WXA Series is an integrated add-on to the SonicWALL Next-Generation Firewall (NGFW). The solution enables comprehensive scanning for intrusions and malware before accelerating the traffic across the VPN or dedicated WAN link, thus maximizing security and performance. The WXA optimizes performance and reduces latency by transmitting only new or changed data across the network after initial file transfer, resulting in dramatically reduced traffic volumes. In addition, the managing firewall enables you to identify and prioritize application traffic while the WXA minimizes traffic between sites. The SonicWALL solution streamlines the placement, deployment, configuration, routing, management and integration of the WXA with other components such as VPNs. Consolidating WAN acceleration with core NGFW technologies including intrusion prevention, anti-malware, and application intelligence, control and visualization at the gateway significantly increases security while lowering the total cost of ownership. 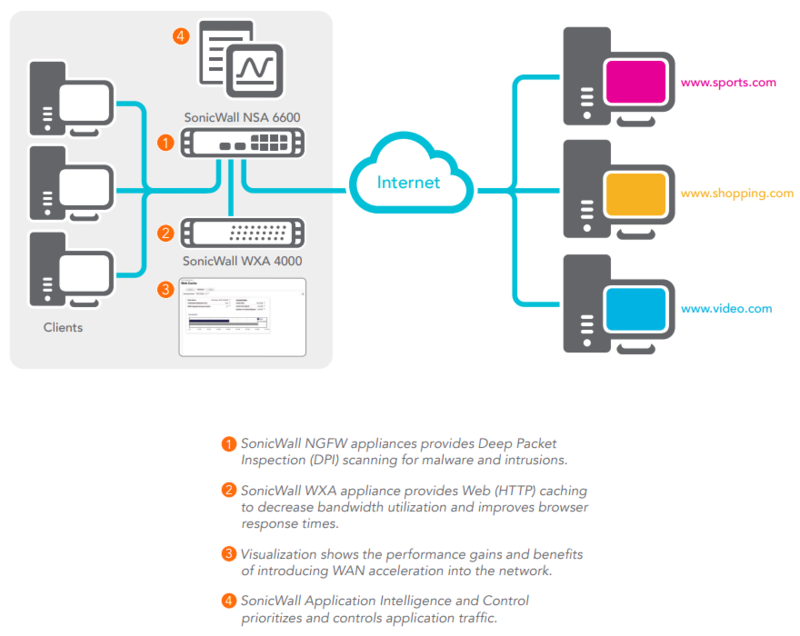 The powerful combination of a SonicWALL NGFW and WXA enables you to more efficiently manage your bandwidth and simplify NGFW and WAN acceleration deployment and management without compromising security. SonicWALL makes it easy for you to add one or more WXA solutions into your network by providing a variety of platform options including both hardware and virtual appliances as well as software. Drastically simplify deployment, routing and integration of multiple WXA appliances across your network through complete provisioning and configuration by a SonicWALL NGFW. Add a layer of security by scanning all data for threats before sending it to the WAN Acceleration Appliance using SonicWALL Reassembly-Free Deep Packet Inspection technology. Optimize network efficiency to give users LAN-like application performance over your WAN by decreasing latency and chattiness presented due to inefficient protocols or application communication. Extend the long-term value of your existing WAN links and enhance the user experience by dramatically reducing bandwidth consumption through byte and file caching. Scale to meet the needs of a growing user population through clustering, which enables several SonicWALL WXA solutions to be linked together at each location. Reduce total cost of ownership (TCO) by increasing efficiency and overall utilization of your existing WAN bandwidth, thus avoiding costly WAN upgrades. Increase performance and reduce latency with data compression across the WAN. Improve response time while decreasing the amount of data transferred when downloading or accessing files from a shared drive, using Windows File Sharing (WFS) acceleration. Increase browser response time while decreasing bandwidth using HTTP (Web) caching. Get better insight into performance gains from WAN acceleration with realtime visualization. WAN acceleration client software allows traffic initiated from remote Windows PCs or laptops running NetExtender to be accelerated. 1 Maximum users may vary depending on the number of connections being generated per user. 2 CIFS/SMB acceleration is available only when the WXA software image is installed on the supplied Dell hardware. 3 The max number of connections is dependent on the hardware specifications and may vary depending on the hardware configuration. The specifications provided are the minimum requirements to run the WXA Virtual Appliance. 4 NetExtender is required in order to use the WXA client software. Please refer to the WXA release notes for supported operating systems. 5 The WXA 500 and 6000 software can be downloaded from www.mysonicwall.com and requires specific Dell hardware in order to operate. 6 Requires SonicOS 6.2 or higher. 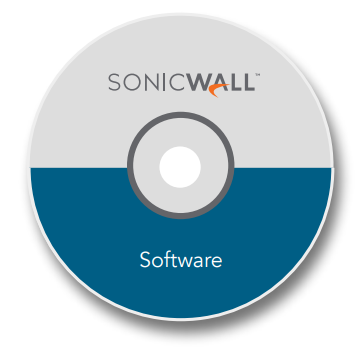 SonicWALL WAN Acceleration Client requires SonicOS 5.9 or higher.